Much time is spent lovingingly considering how the pieces are cut out of the fabric, stirring pots of plant matter steeping on top of a stove in my kitchen, drying out on the line in my backyard when the weather cooperates. Slow fashion at its core - many hours of stewing and stitching are required, most garments going through two to eight different baths to create the colors and textures you see in the shop. The collections are a broad mix of fabrics, inspirations, and technique. Some garments are patchworked from the leftover scraps saved from previous creations, some have been overdyed again and again until just the right color is achieved. Some have gone through so many transformations, been worked on for so many months, evolving and developing with the seasons, just like the natural materials they have been created from. Through these garments and the process of creating them, I hope to inspire others to explore in their own ways with the plants and materials we are surrounded with, which is why I frequently lead workshops on techniques such as embroidery and natural dyeing. As part of my personal artistic evolution, I'm constantly playing with new ideas and projects. 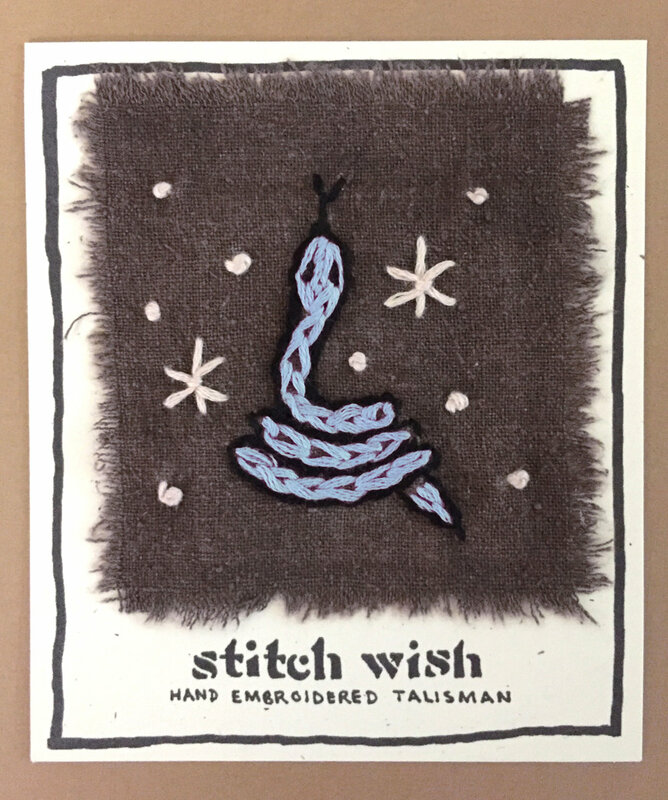 My latest project, Stitch Wish, was created when a store approached me to ask for hand-embroidered talisman, and in the process of manifesting them I fell so in love with the concept that I expanded the selection to be its own collection of goods. Stitch Wish is an illumination of the symbols dancing throughout time, simultaneously archaic and futuristic. These talisman patches have been created for specific intentions with the craft of embroidery, through meditative and visually enhancing stitches. These little hand embroidered talisman are here to help you, whether you’d like to magnify your intentions, draw in desires, or express devotion. Our conscious minds speak in verbal language, our subconscious speaks in images. Interpreted in a medium so closely familiar to us, textiles, these images get to travel with us as we find ways to become more transformational and expansive.